John Loughborough Pearson (1817-97) was one of the most eminent and distinguished architects of the Victorian Gothic Revival movement, completing designs for over 200 new churches and church restorations in England alone over the course of his lengthy career. Although the architecture of Pearson’s churches has been studied in some detail, relatively little research has been undertaken to understand the significance of their interiors: the new fixtures and fittings (including moveable and portable items) which formed part of each commission, and the particular role of the architect in their design and execution. Without this understanding it can be particularly difficult to address conservation issues alongside the pressure for change and development to meet the needs of modern congregations and other factors. 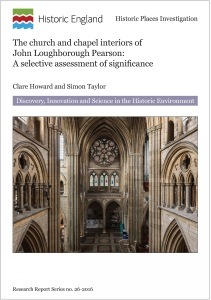 This report, which forms part of a wider national project looking at the works of prolific Victorian church architects, presents the results of an assessment covering a selection of Pearson’s church interiors dating from the beginning of his independent career in 1843 until his death in 1897. It is intended to assist decision-makers including Historic England, ecclesiastical authorities and members of the public who wish to ensure that the value of Pearson’s church interiors is fully recognised and taken into account when changes are proposed. It also serves as a pilot study offering general guidance for the development of similar research focused on interiors designed or commissioned by other prominent 19thcentury architects.